You might already know that the name of bock beer comes from the German town of Einbeck. But did you know this? 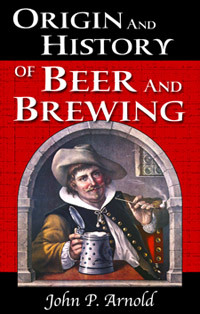 John Arnold wrote that in Origin And History Of Beer And Brewing, one of two books rich in beer history recently made available in reprint form from BeerBooks.com. The other is Louis Pasteur’s Études sur la Bière (Studies On Fermentation). BeerBooks.comfounder Carl Miller said he has seen a strong and growing demand for rare and early brewing literature in recent years. We hope this is a sound business venture, because we’ve long benefited from his affection for beer history. Visit BeerHistory.com to see what we mean. The book doesn’t contain much that happened after the 18th century and doesn’t try to be a comprehensive history – for instance, leaving much of what occurred in England to other texts. It’s hard to imagine now, but before Pasteur proved them right in the mid-19th century, the few biologists who held that yeast was the cause of, and not the product of, fermentation were ridiculed. Manufacturers of wine, vinegar and beer didn’t know if a week or two after production they’d have something they could sell or would have to dump – and the scientific establishment offered no help. That set the state for Pasteur to prove that living cells (yeast) were responsible for forming alcohol from sugar, and that contaminating microorganisms turned the fermentations sour. He identified and isolated the specific microorganisms responsible for normal and abnormal fermentations in production of wine, beer, and vinegar. He showed that if he heated wine, beer, and milk to moderately high temperatures for a few minutes, he could kill living microorganism and thereby sterilize (pasteurize), the batches and prevent their degradation. It should be surprising that the sub-title of Studies on Fermentation is The Diseases of Beer, Their Causes, and the Means of Preventing Them. As Randy Mosher points out in Radical Brewing, ancients were clearly aware of the magic yeast (the Sumerians had 50 words for it) performed. But today we’re happy today to still marvel at that magic and not end up with sour beer (unless, of course, that’s what you want). You don’t have to read Pasteur to understand why, but it’s as close as we’ll ever come to listening to him discuss his breakthrough work. Be warned that these books are neither light nor necessarily easy reading. 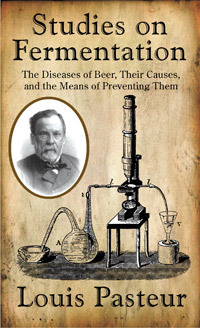 Pasteur was writing late in the 19th century, in French and interested in communicating with scientists and brewers trained in science. Arnold first wrote Origin and History in German, then it was translated into early 20th century English. And, for obvious reasons, you won’t find anything about modern brewing practices or beer’s role in contemporary society. Arnold makes reference to the temperance movement that would soon bring Prohibition to the United States, but obviously you won’t find him comparing the roles of spirits, wine and beer in American society with that after Prohibition was repealed. You’ll have to connect the dots. If Miller is right, a growing number of beer enthusiasts are inclined to do that. I recently started another new beer history book, The Miller Beer Barons by Tim John. So far it is a pretty interesting read.